We listed the aircraft on behalf of the seller Ross Z. after his purchase of a newer model of aircraft. He came to us after several offers and transactions unfortunately fell through in previous attempts with another broker. 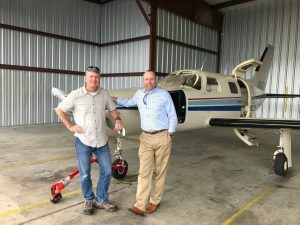 President Greg Hermans asked sales team member Darren Klink to take the lead on the listing and he got right to work marketing the aircraft to potential buyers throughout the world. The buyer Kevin G. ultimately came to us from Texas and was an experienced pilot and aircraft owner. He was looking for an upgrade from his Beech Bonanza and chose the Piper Malibu for it’s speed, comfort and efficiency. He planned to use the aircraft for business and family vacations. After negotiating the sales price, terms and pre-buy inspection items, the buyer and seller agreed to move forward. Within just a few days, Kevin visited Norfolk for the final inspection and test flight and everything went great. From initial contact to closing, the sale took less than two weeks! But the buyer needed more! Although He was an experienced pilot, he was not checked out in the Malibu and needed both ground and flight instruction to become familiar with the aircraft’s systems and handling characteristics. Before the closing occurred, Darren referred Kevin to our local training partner, DBL Aviation in Norfolk, for the training he needed to be able to fly the airplane home. And after a day of ground school and a day of hands-on flight training in his new airplane, Kevin was ready to fly himself home. He made a successful trip back to Texas and was extremely pleased with his entire experience with Norfolk Aviation. Ready for a stress-free buying or selling experience? We’ve has got you covered. Ross & Kevin’s story isn’t an exception – at Norfolk Aviation top-notch customer service is the rule and we strive to give our clients to best experience possible when buying or selling an aircraft. Call us today at 757-724-6047 to find out what we can do for you!